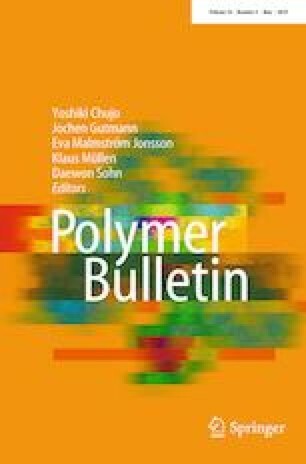 In order to prepare a synergetic flame retardant, the magnesium hydroxide (MH) and hexaphenoxycyclotriphosphazene (HPCTP) were blended with ethylene–vinyl acetate copolymer (EVA). The EVA–MH–HPCTP composite materials were characterized by various tests including Fourier transform infrared spectroscopy, X-ray diffractometer and scanning electron microscopy (SEM). The SEM images indicated that the compatibility of EVA–MH–HPCTP composite materials was significantly promoted due to the bridging effect of HPCTP. Therefore, the EVA–MH–HPCTP composite materials possessed better processability which was evidenced by the melt flow rate tests. Comparing to the traditional addition dosage (over 50%) of MH in previous reports, the EVA–MH–HPCTP composite materials showed significant flame-retardant efficiency even when the dosage of MH was lowered to 20 parts per hundred resins. The experimental results suggest that the prepared EVA–MH–HPCTP composite material may be a potential candidate in various industrial applications due to its excellent flame retardant. Financial support of National Natural Science Foundation of China (Nos. 21506195, 21775138, 51578509) and Zhejiang Provincial Natural Science Foundation of China (Nos. LQ17E080011, LQ16B060001) is highly appreciated.